GitHub - oppia/oppia: Tool for collaboratively building interactive lessons. Want to be notified of new releases in oppia/oppia? * Added proper check to allow translation in Hinglish. * Added comment above the affected lines. 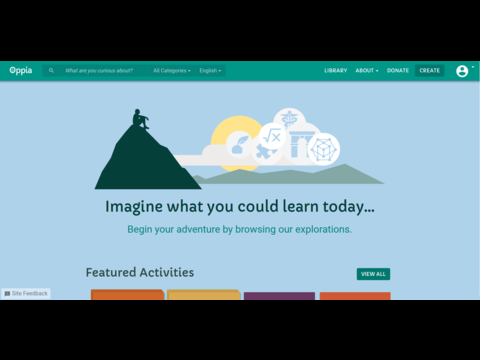 Oppia is an online learning tool that enables anyone to easily create and share interactive activities (called 'explorations'). These activities simulate a one-on-one conversation with a tutor, making it possible for students to learn by doing while getting feedback. In addition to developing the Oppia platform, the team is also developing and piloting a set of free and effective lessons on basic mathematics. These lessons are targeted at learners who lack access to educational resources. Oppia is written using Python and AngularJS, and is built on top of Google App Engine. Create a new, empty folder called opensource/ within your home folder. Navigate to it (cd opensource), then fork and clone the Oppia repo. This will create a new folder named opensource/oppia. The Oppia project is built by the community for the community. We welcome contributions from everyone, especially new contributors. You can help with Oppia's development in many ways, including art, coding, design and documentation. Developers: please see this wiki page for instructions on how to set things up and commit changes. All other contributors: please see our general contributor guidelines. If you have any feature requests or bug reports, please log them on our issue tracker. Please report security issues directly to admin@oppia.org. The Oppia code is released under the Apache v2 license. We also have public chat rooms on Gitter: https://gitter.im/oppia/oppia-chat and the #oppia channel on Freenode IRC. Drop by and say hello!